Hi everyone! I don't know about you, but I'm a huge fan of Hedgehog Fibres' yarn. From the amazing color palette, to the fun and expressive names of the colorways, their yarn is always a treat. 1) How did you get started in dyeing yarn? Was it a goal from the start to launch a dyeing business or did occur organically? I picked up knitting as a hobby in my early twenties and I was instantly hooked. As soon as I got sucked into the knitting world I knew I wanted to create my own line of hand-dyed, soft, squishy yarns. Hedgehog Fibres started as a full time gig right away, there was no messing around. I was pretty broke for a while! I worked from my home for about a year or so before moving into the first premises in 2010. 2) As someone who has never had the opportunity to dye fiber, can you tell us what a normal dye day is like for you? Hedgehog Fibres employs around 20 talented people, so not all of my work days are dye days anymore. I remain the head dyer and the creative director, and while I dye for orders occasionally, I usually work on new colourways, I oversee Potlucks and Club colours (we do a ton of one of a kind colourways! ), sample new bases, troubleshoot for the dyers and mostly fun things like that. 3) Your color combinations are always beautiful and inspiring, can you tell us where you find inspiration? I love coming up with new colours, techniques and applications. I'm always thinking of the next thing, trying new ways of laying the dye on yarn, new colour combos. It's always about colours. I love colours and the brand progresses as my preferences shift and evolve. I also paint, well it's more like just putting colours on paper, but it's a great way of getting inspired and playing with colour. I use big brushes and thick acrylic paint, I like how quickly I can visualise ideas. 4) Speaking of colors, can you take us through the process of how a colorway is born? Has there ever been a time that a colorway didn’t translate well? Sometimes I think of a great name and then create a colourway to match (like Teacup) or sometimes I realise there's something missing in the line and then get completely obsessed with a colour - I have to cast on with it and knit with it immediately and that definitely means it has to be added it to the line! I'm into speckled watercolours and strong vivid colours right now, there are new colourways coming out soon, and I'm very excited about them. Some colours are definitely happy accidents! Crybaby was such a great potluck that we added it to the line. There's never a colourway that can't be fixed by adding a pink speckle! Bright pink makes everything better. 5) The names of your colorways are almost as fun as the colors themselves! How do you come up with the names for each colorway? We have colour naming parties at work! I like to gather everybody and brainstorm when we have new colours coming out, it's a ton of fun. We also keep a list of potential colourway names to which everybody can add their suggestions. 6) Do you have any tips for the adventurous crafter who wants to try dyeing some yarn? Go mad and have fun with it! As Stephen West says: 'More is more and less is a bore'. Once again, we would like to thank Beata for her time. We hope you've enjoyed learning about the magic behind Hedgehog Fibres. Make room in your stash, you won't want to leave without some! The knitting olympics are upon us and this summer we're sweating it out in Rio... well not really but I can pretend. Wait... what exactly is the knitting olympics you ask? Well to keep it brief... you pick out a project, cast-on during the Olympic opening ceremonies on Friday, August 5th and then proceed to knit like the wind to project completion before the Olympic closing ceremonies on Sunday, August 21st. You can either participate on your own, with a local group of friends or with virtual friends over Ravelry in the Ravellenic Games 2016 group. I'm taking on the knitting Olympic challenge this year and I decided to keep it simple, keep it bulky and keep it in the U.S.A. by using all american wool. I'll be casting on the Lainey Cowl by Carrie Bostick Hoge using Cestari Yarn Mt. Vernon 3-ply bulky that I picked up during our Shephard's Day event at the studio. I think this pattern/yarn combination is a match made in heaven. 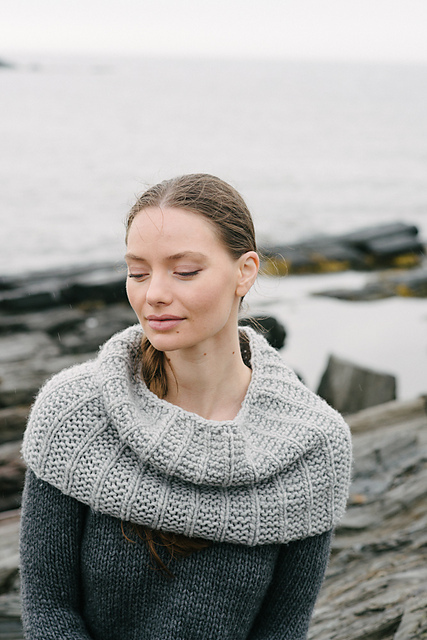 The simplicity of the Lainey Cowl calls for a yarn that will create on point stitch definition. With only a few weeks to wrap this project up into completion, look for some finished project photos and yarn thoughts later this month. Hello fiber artists! I'm sure we can all agree that yarn is a very important part of our lives. With it we indulge our senses and express our love for our friends and families. Yarn is everywhere, yarn is love. As you knit that sweater or pair of socks, do you ever think there must be more I can do with this yarn? 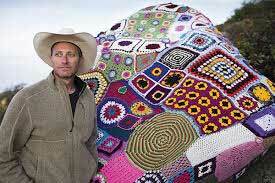 Stephen Duneier took that question and turned it into massive art installations, also known as yarnbombs. If you aren't familiar with the term, yarnbombing is a form of street art that uses knitted or crocheted pieces instead of paint. 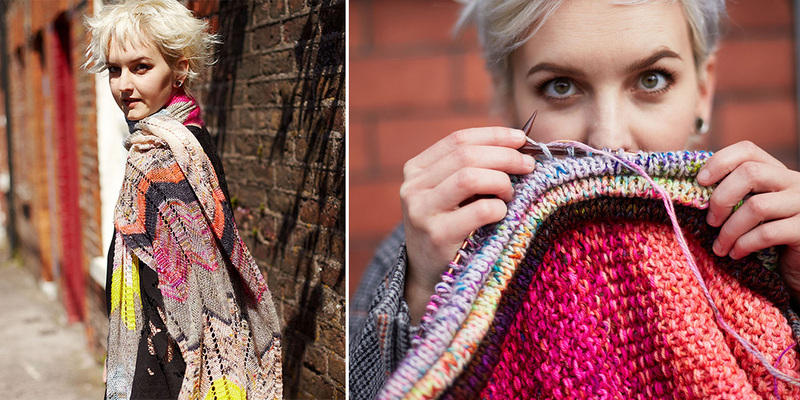 A low impact form of art, yarnbombs bring beauty and a new appreciation for the crafts we love so much. 1. Can you take us back to when you first picked up a crochet hook or knitting needles and what compelled you to do so? 2. I've been following your work for several years now, and I've always wondered what gave you the idea to blend yarn and nature. They don't really seem to go together, yet your installations make it seem like they are a perfect match. 2007’s new year’s resolution was to hike every trail in the mountains of Santa Barbara, which was ambitious for me, given that I’d never been on a hike in my entire life. Those first few months, I carried big cans of bear repellent, enough food, water and clothing to keep me alive for days, and two hunting knives at the ready. It was a serious case of overkill. Over time, I began to relax and really started enjoying myself. If I don’t get out there at least 3 or 4 times a week, I’m not myself. I’ve met so many people in Santa Barbara who live right at the base of some of the best trails in the world, yet they’ve never set foot on them. 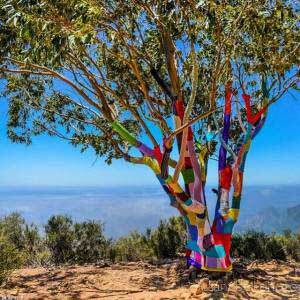 That first yarnbomb drew so many people out into the wilderness, and for some who were already hikers, it gave them a reason to go further. Over the 9 days it was up there, I went back several times a day just to listen to people talk about their experience. I’d sit silently to the side, listening as hikers turned the corner and unexpectedly stumbled upon this ridiculous, whimsical, Seuss-like tree. Their conversations would stop mid-sentence, interrupted with giggles and comments like, “What the…” and “Whoa!” When people found out I was behind it, the feedback was unanimous and undeniably genuine. I had women with tears in their eyes, hug me and thank me for doing it. I met teenagers who had returned 3 and 4 times, leading new groups, including their parents to the tree. It was, quite simply, the most magical thing I’d ever experienced. When I learned how to crochet, I returned for another yarnbomb in the mountains. It became just as much about recreating that experience, building a community and drawing people back to nature as it was about the art. 3. Your projects are loved by so many around the world and bring so much joy, yet they are not without those that criticize. How do you deal with the few negative responses to your work, and how does it impact your art? That is true. I’ve had threats of violence directed at me and my installations on social media and had two installations torn down within hours of going up. To be honest, I can appreciate some of the criticism, but only because they don’t take the time to learn how much effort I put into making sure that I leave no trace. I don’t harm or interfere with wildlife and my installations have very limited lifespans. A couple of my installations have incorporated responses to the criticism. After the Spiderweb and Starfish yarn bombs were torn down, I decided to make a giant American flag for the Lizards Mouth installation, figuring it might discourage a looter from destroying it. The entire concept of the Alien Campsite was a direct response to my critics who said that the installations are unnatural and don’t belong in the wilderness. The reality is, people camp out in the wilderness all the time. Hikers and campers are the same size and shape (roughly) my aliens, and dress in brightly colored, man-made fabrics just like my aliens. 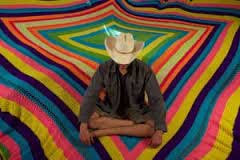 They also sleep in brightly colored tents made out of man-made fibers. I had hoped that they would see the hypocrisy of their criticism, but alas, they did not. 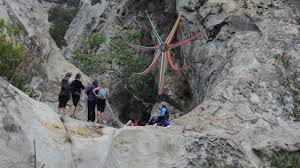 Even with a permit and praise from the US Forest Service and approval from the Chumash Tribe, threats were made on message boards to defecate on the installation, and even pour gasoline on it which they would light on fire. What I’ve come to realize is that you can't please everyone, that many of the critics never leave their computers, and that far more people enjoy the temporary installations than oppose them. 4. 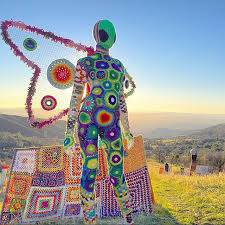 You lead a multifaceted life, how would you say your fiber art has impacted the other aspects of your life? The yarnbombs connect every aspect of my life. They are a way for me to express myself artistically, they present engineering and logistical challenges, they connect me with people from all walks of life, they incorporate my love for the outdoors and they push me to learn new skills. I’m not a very social person, truth be told, I am an introvert. That’s not to say that I am shy, I just like to spend time by myself. As the Yarnbomber, I am able to facilitate community building around the world, while being reclusive. 5. You attempted and completed the world's largest granny square. Congratulations! Sometimes as fiber artists, we get burnt out on certain aspects of our craft. Would you say you ever got burnt out on crocheting the granny square? Do you have any advice for other crafters on how to beat or push through the burn out? I have spent nearly 30 years studying behavior and in particular, decision making. Central to the approach I have developed is a concept I call, Bija. It is the act of breaking giant goals, like new year’s resolutions and bucket lists down to their tiniest components, and then focusing on them instead of the goal itself. It wasn’t really about setting a world record and getting in the Guinness Book. (In fact, I reached out to the Make a Wish Foundation to see if there was a child who wished to set a world record. I figured they could do the last few stitches and get in the book instead. They told me they didn’t have anyone with that wish.) It was solely about setting an incredibly ambitious goal, devising a plan for achieving it and then executing. In other words, it was about the journey more than the destination. 6. People from 41 countries and all 50 states, including myself, have contributed to your yarnbombs. Would you say that certain types of knitting or crochet are more popular in one country or another. Actually, more than differences, what I discovered is just how similar everyone is. 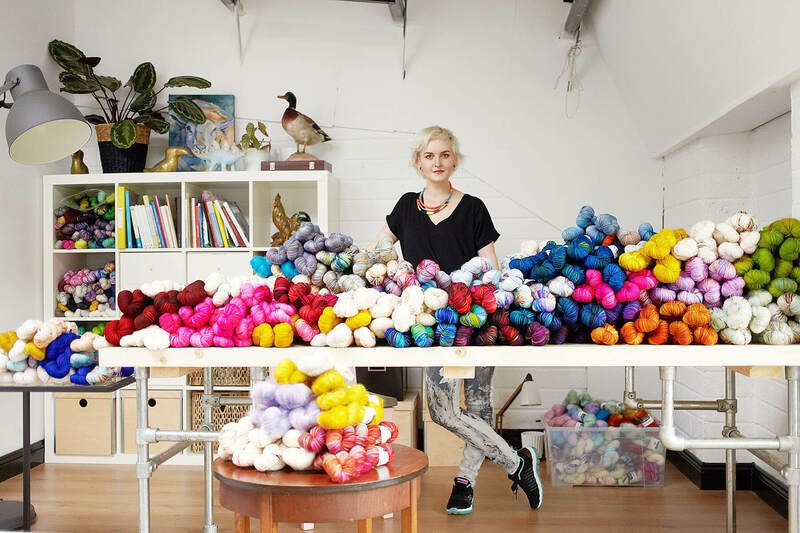 Fiber artists around the world share a passion for yarn, creativity, the desire to connect with each other and most importantly, unfinished projects. If it wasn’t for projects gone wrong and works in progress, I don’t think my installations would have grown to be as big as they have become. 7. I have often been tempted to do a little yarn bombing around town, what advice do you have for those of us that want to add a little yarn art to our neighborhoods? My advice is to just do it. Make something that will bring people together, that will make them smile or giggle. Then take it away, so each time it appears they will fully appreciate the whimsy and color you’ve introduced to their lives. Oh, and go big or go home! A big thank you to Stephen Duneier for taking the time to talk to us. I hope this has inspired you to try something new, or continue yarnbombing. Let's all go outside and make the world a little more beautiful!